Lock in a great price for Fairfield Inn & Suites Ukiah Mendocino County – rated 8.1 by recent guests! Located near the Municipal Airport, off the Redwood Highway, Fairfield Inn Mendocino County offers modern accommodations in central Ukiah. 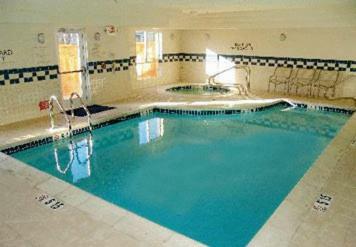 It features a pool with a hot tub and a well-equipped gym. Spacious rooms at Fairfield Inn & Suites Ukiah Mendocino County come with free Wi-Fi and a cable TV. Each room has a well-lit work desk, as well as a pantry with microwave and refrigerator. Guests can enjoy a hot daily buffet breakfast at the restaurant of the hotel and discover the many local eateries that dot State Street. On site vending machines provide refreshments and snacks 24/7. Popular nearby attractions include the popular Lake Mendocino and Parducci Winery, both within 10 miles. The Grace Hudson Museum on Ukiah’s Main Street, is one mile from the Fairfield Inn & Suites hotel. Free parking is available at the property. This property also has one of the top-rated locations in Ukiah! Guests are happier about it compared to other properties in the area. This property is also rated for the best value in Ukiah! Guests are getting more for their money when compared to other properties in this city. When would you like to stay at Fairfield Inn & Suites Ukiah Mendocino County? With a flat-screen TV and free Wi-Fi, this room has a microwave and a refrigerator. This studio has a sofa, air conditioning and flat-screen TV. This suite features a spa bath, air conditioning and satellite TV. At Fairfield Inn by Marriott®, we provide you with exactly the hotel experience you're looking for - a clean, comfortable room at an affordable price. 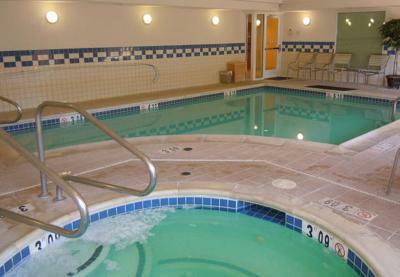 Enjoy a complimentary continental breakfast, exercise room, pool, and high-speed Internet access. House Rules Fairfield Inn & Suites Ukiah Mendocino County takes special requests – add in the next step! Fairfield Inn &amp; Suites Ukiah Mendocino County accepts these cards and reserves the right to temporarily hold an amount prior to arrival. Fairfield Inn & Suites Ukiah Mendocino County accepts these cards and reserves the right to temporarily hold an amount prior to arrival. Staff not very personable; I’m accustomed to being greeted, thanked and welcomed when staying at hotels. Trusted name branding, clean and safe; good location for freeway access and last minute reservation; parking limited for travel vehicles/trailer. Beds to soft. Weight room a joke. Bed was super plush yet supportive. The staff was very friendly and helpful. A little noisy. The doors are super heavy and I wasn't prepared for it. So, the door came back and hit me and nearly knocked me down. I'm not short and weigh over 190lbs. So, the weight was pretty intense. Not quite as nice as other Fairfields. Bed, Bedding, Towels were great! Breakfast was fantastic. While the eating area was nice,and the hotel offered a good variety of breakfast foods,the quality of food could stand improvement. The staff was delightfully friendly,helpful and very accommodating. The common are and the room very clean and comphy.Excellent value for the price.